Lasky, K. (2010). Lone wolf. New York, NY: Scholastic Press. Wolves of the Beyond is a spinoff series from the Guardians of Ga’Hoole series and set in the wilderness outside of the Ga’Hoole territory known as the Beyond. Faolan, a lone wolf is intentionally abandoned by his clan due to a deformity on his paw, a mark on the padding in the design of a swirl. Left to die as a new born wolf pup, Faolan is found by a she bear that has recently lost her own cubs. Raised by Thunderheart, Faolan is part wolf and part bear and utterly confused. Book one, of the Wolves of Beyond, tells of Faolan’s first year of life. When Thunderheart goes into her deep winter hibernation, Faolan leaves the cave to explore. Since Faolan is biologically a wolf, he can’t force himself to stay in a cave regardless if has the spirit of a bear. On one of Faolan’s outings from the cave when the season is nearing spring, Thunderheart awakens, and in a disorientated sleep goes in search of her adopted son, Faolan. Shortly after she leaves the cave a powerful earthquake hits and Thunderheart is trapped under a massive pile of fallen rocks. When Faolan returns to the cave and Thunderheart is no longer there, he goes out in search of her. During the course of this search, Faolan discovers his own self. On his journey he stumbles upon a cave with ancients drawings marked on the stones within it. From these drawings he learns the history of who he is, who he is not, and the rest of the world around him. While searchin, Faolan meets the Outlanders, Gwynneth (a Ga’Hoole owl), the Wolf Clans of the Beyond, finds Thunderheart, and discovers that his birth mother is still alive. Readers will quickly fall in love with Faolan, with the curious spiral marking on his footpad that was separated from his mother and siblings and left to die as a pup due to no their clan rules of no weaknesses or defects allowed. Yet Faolan, not only survives but thrives and becomes immensely strong in and out due to his adoptive mother, a bear. Faolan’s birth mother, Morag is cast out of the clan after her pup is taken away to die so as to prevent future birthing of additional defective pups (her bloodline is assumed bad). Shinbaan the Obea, shamed by the inability to conceive is kept by the clan for the sole purpose to seek out and destroy all new born wolf pups that are less than perfect. Her own shame fits her to this role perfectly, and like all clans, an Obea is necessary and Shinbaan serves her role dutifully. Thunderheart, a she bear, still mourning the loss of her cubs finds Faolan deserted, rescues him, and raises him as her own. Thunderheart teaches Faolan to use his defective paw until it has not only the strength of a wolf but that also of a bear. The Clans – Wolf Packs of the Beyond are a society of wolves who strengths are their social structure and values. They are skillful hunters and instinctively know how to work together as one to bring down their prey. The Clans of the Beyond honor the cycle of honor their prey as it like themselves is a part of the circle of life (all nature has a part in this coexistence where death and life are necessary. The Clans of the Beyond understand that they are part of a bigger picture. Unlike the Clans of the Beyond, there are the Out Clanners – Wolves of the Outermost. These are rogue wolves who work independently of a pack. They are savage and dumb. They do what it takes to survive including eating their own species. They live without a clan nor would a clan want them. The Wolves of the Outermost live by a standard that has no honor or social values. Gwynneth, a wise masked owl from the Ga’Hoole territory has chosen since the end of the War of the Embers to no longer create and forge weapons. As a talented rogue metal smith, she has chosen to user her skills to create beautiful artistic creations. 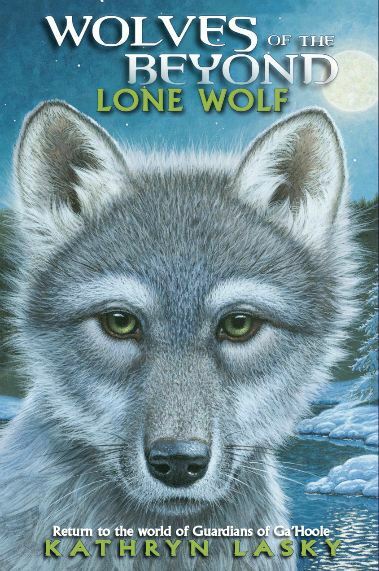 Lone Wolf is a beautiful story of loss, acceptance, self-discovery, and destiny. Readers young and old will fall in love with. Just like the unity of the Clans of the Beyond, the characters each have their essential purpose to the overall story. The story is highly descriptive, the plot is engaging, and be prepared for some highly emotional moments while reading of Faolan’s journeys. If you enjoyed reading popular anthropomorphic fantasy series such as Erin Hunter’s Seekers, Warriors, and Survivors, or have already read Kathryn Lasksy’s previous series Guardians of Ga’Hoole, then the Lone Wolf and all books from the Wolves of the Beyond series are guaranteed enjoyable reads.